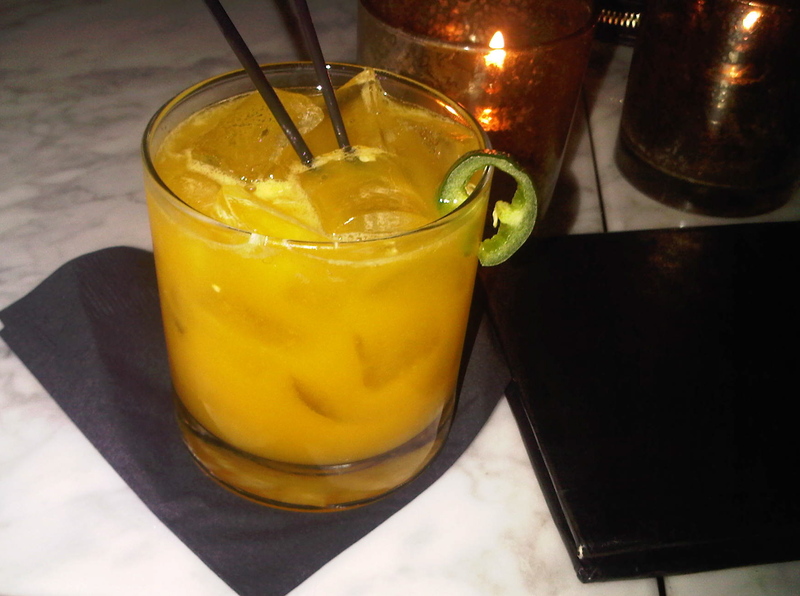 Hot Passion Cocktail, made with rum, cointreau, fresh passion fruit puree, fresh citrus, and then jalapeno. Every second Saturday of the month, there is an artwalk that takes place in the Design District here in Miami. The people who attend are just as interesting to look at as the art, and the alcohol is usually free. This being said, my roommate, Ariana, and I look forward to going every month. It is a nice change from the frat scene in the Grove, and it is probably the most “cultural” event that exists in Miami…sadly. Anyways, this Saturday we decided to grab some dinner at Cafeina before heading to the galleries. Cafeina is certainly more of a bar/lounge scene than a restaurant (not suggested for a dinner date), but the food is surprisingly delicious! My girlfriends and I sat on a sofa around a low table and got started with a round of drinks—the hot passion cocktail, made with rum, cointreau, fresh passion fruit puree, fresh citrus, and then jalapeno. This drink reminded me a lot of the Chili Passion Martini from the Setai(which is my favorite drink ever) and so naturally, I loved this one too. Anything with jalapeno is good in my book. 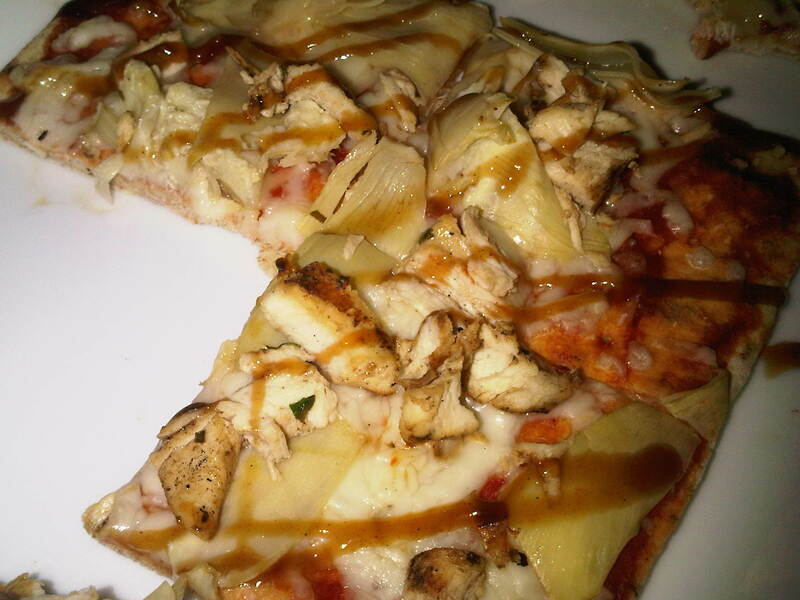 Then for food we ordered up a Flatbread, made with artichokes, roasted chicken, tomato sauce, mushrooms, mozzarella, and hoisin sauce. The hoisin sauce was a really nice and unique flavor with the pizza, but I had some problems with the dough. The crust tasted like frozen pizza dough, which is unacceptable at any food establishment in my opinion. It had the cardboard texture of communion wafers that you receive on Sundays at mass. I don’t know about you, but personally, I’d rather my pizza not remind me of the body of Christ! 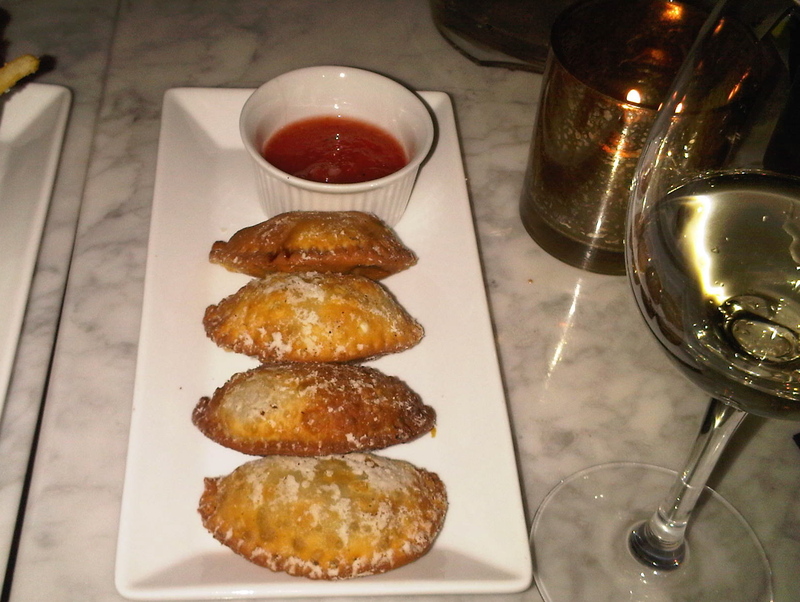 Next to be served were the Beef Empanadas served with spicy “criolla” sauce. These were awesome! It is hard to screw up anything meaty and fried but he dipping sauce that accompanied these took it to another level! I would definitely order these again. 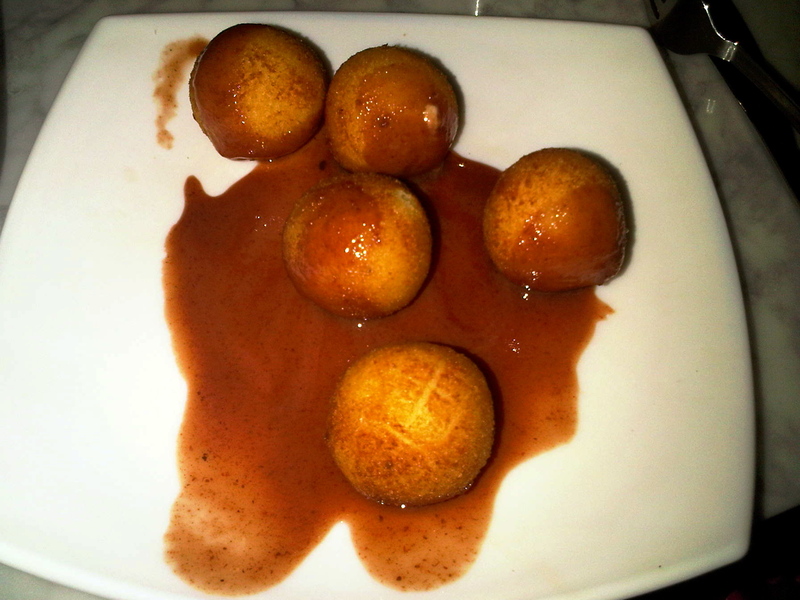 Speaking of fried things, we also got an order of the Goat Cheese Croquettes made with homemade guava sauce. I knew I would compare these to the ones served at Sugarcane (which are my favorite and amazing!! ), and these actually exceeded my expectation. They were very, very similar and the sauce was equally as delicious. We fork-fought over the last couple bites, and I shamelessly scraped he plate clean. 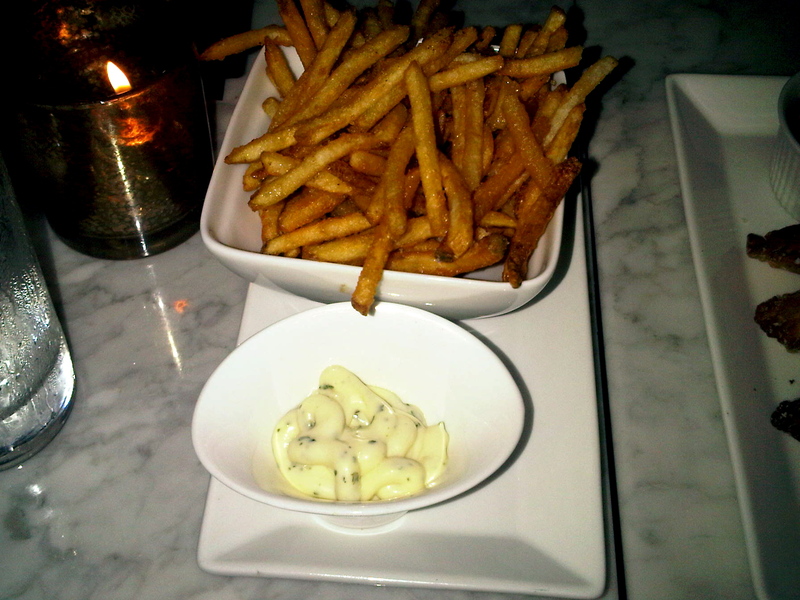 Last but not least, we couldn’t resist ordering the Truffle Fries served with cilantro truffle mayo. The truffle oil was surprisingly good quality, considering the bucket of fries was only four dollars, and after polishing off the first order, we got a second! The mayo dip was an outrageous combination. Cafeina gets the value in good condiments and it takes their otherwise standard menu to an elevated level. Overall, I really enjoyed the Cafeina experience. I was pleasantly surprised by the quality and presentation of the food, considering it is more of a bar/lounge than restaurant and I thought that the atmosphere was perfect for starting off the night. They had artwork set up in the outdoor area and the people were very friendly. Just make sure that you make a reservation, especially if you want to sit outside!!! They fill up fast!